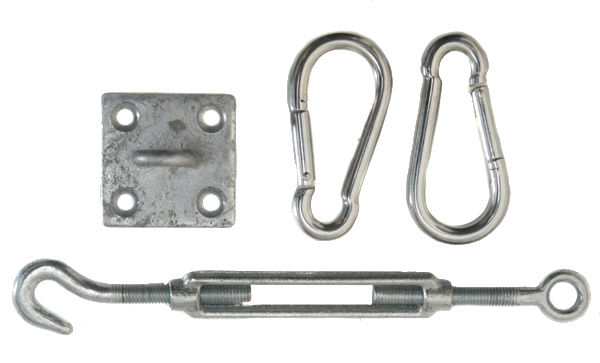 This galvanised steel fixing kit is ideal for installing square and rectangular sail shades to all solid structures such as concrete, brickwork and wooden beams. The high quality, galvanised steel fixtures are extremely strong and rustproof. The kit includes everything you need for quick and easy installation. "The metal plate snapped under the wieght of the shade sails when they filled up with water!" "Excellent product for shade sails purchased. Simple instructions to fit." "Just what you need to finish the job." "Very good value for money. Good quality. Easy to assemble and fix. Excellent for the job. Recommended"
"Getting tired of this now. Just not clear what i’m Being asked to do." "Good as a kit for sail fitting"
"Great quality that worked perfectly with the shade sail." "Excellent quality and not too difficult to erect, following the instructions." "Essential equipment. Does the job well."